Happy Leap Year one and all. Today’s card I made for my neigbor Sergio’s (aka the brown man) birthday. His birthday was on Ground Hogs day and for years I have made him a ground hog birthday card but this year I decided to make him a card to celebrate his Hispanic heritage. Cammie got the Packed for Everything Stamp Bundle (available now in the occasions mini)for free for having record sales or some such Stampin Up promotion and really had no use for the set. I saw the the pinata in the packed for birthday and thought I could use it to make a birthday card for Sergio. Cammie stamped the images several times and mailed them to me to use. 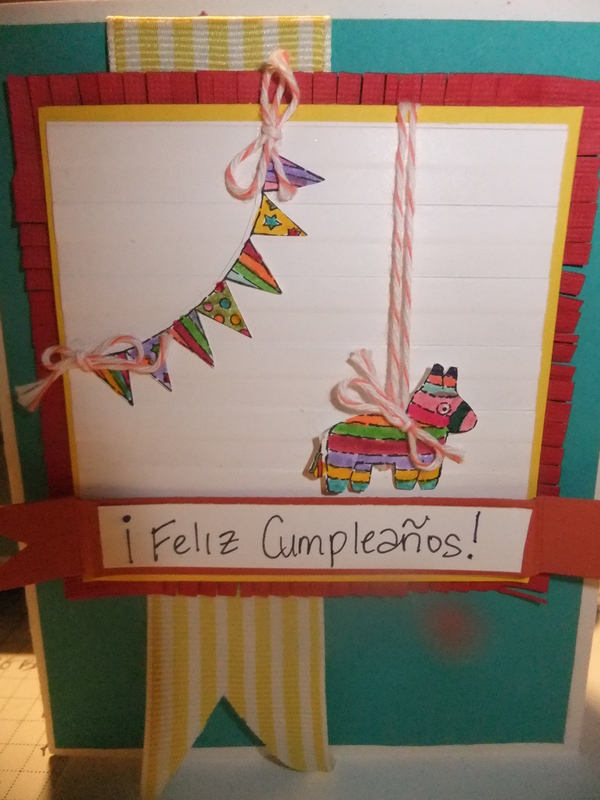 The images were fun to color but very intricate to cut out but I added some calypso coral bakers twine #125573 and a fringed mat with a Feliz Cumpleanos banner to complete this card. It would also be cute for a Cinco De Mayo party inivte. 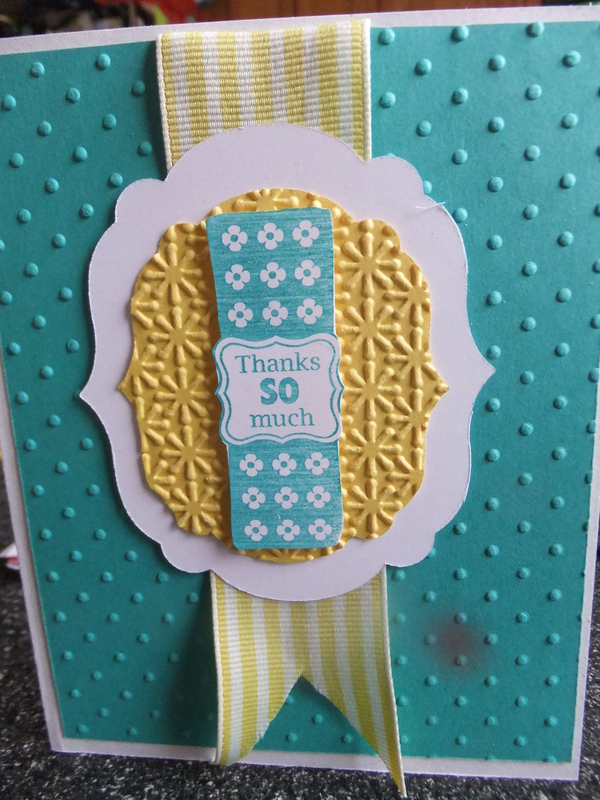 Today’s post is the 4th and final card I have made using the It’s a Wrap Occasion stampset #123592 and was used as the thank you for my customers orders in January. This card is simple but packed with a lot of punch! It features the labels collection framelits dies and the perfect polka dots #117335 and the snowburst #124096 textured embossing folders. I added a banner of daffodil delight 1 1/4 inch striped ribbon #119770 to complete the card. So I used the stampset 4 times for cards and many times as party favors so I think I have justified purchasing this stamp set. Continuing with the It’s a Wrap stamp set #123592 from the Stampin Up IBC, I stamped and embossed 3 of the images to get different textures for the shopping bags. I cut them out and adhered 1/8 ” black taffeta ribbon #119261 to them to form the handles. I punched coordinating hot pink tissue using the postage stamp punch #122344 and added to the shopping bags. One of the bags has a heart punched from the small heart punch #117193. THe card base is pretty in pink cardstock embossed with the heart texture plate from the adorning accents texture folders #125601 from the new Stampin Up occasions mini catalog. 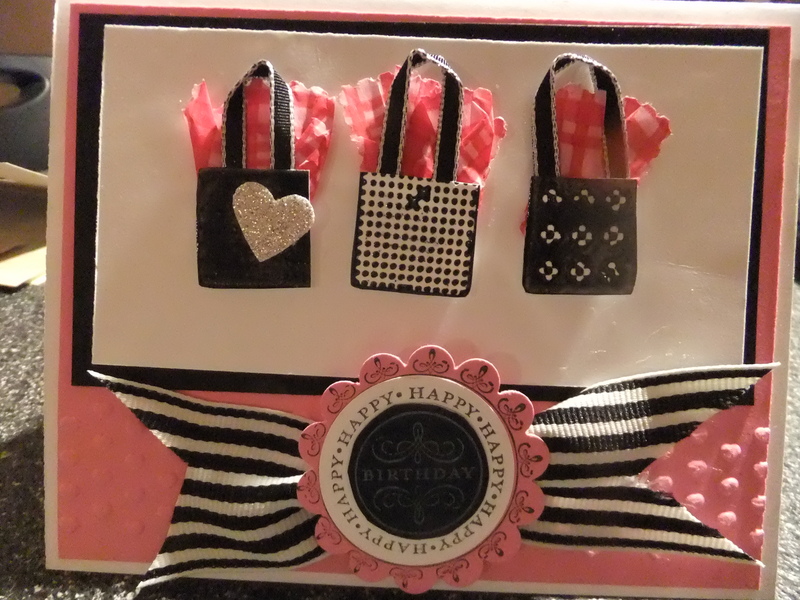 I then added a bow using the black 1 1/4 ” striped ribbon and layered the Happiest Birthday wishes from Hostess stamp set #122617 to create a coordinating accent. The best part of this card you cannot see- it is the inside sentiment and my inspiration for this card- it says… the world got a present the day you were born. So I created a card with presents to use this stamp set. This card took a lot of time because of all the detail but I like how it turned out and used it as my second swap for the regional Stampin Up convention. Todays card is absoultely a simple and cute birthday card I made using the It’s a wrap stampset #123592 from the Stampin Up IBC. 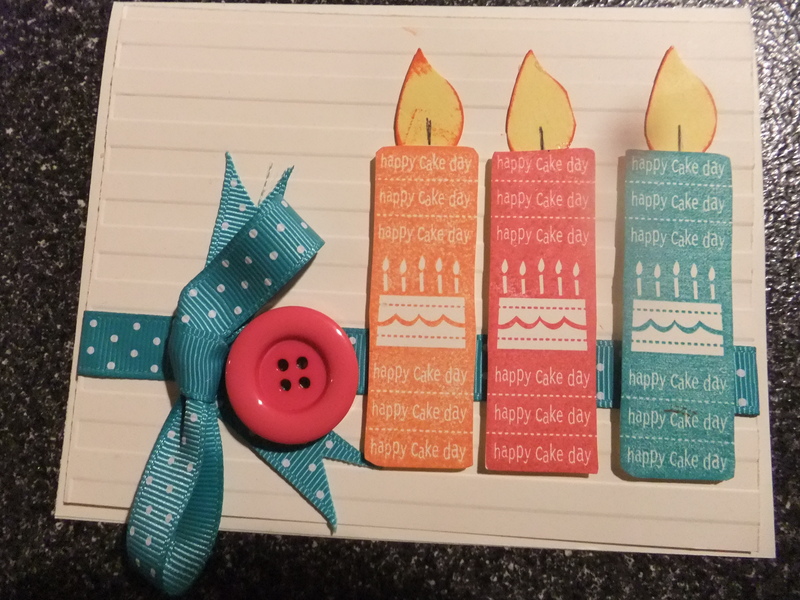 I stamped the birthday image 3 times in 3 different bright colors and cut them out to make the candles. I punched the flames from daffodil cardstock using the wing from the bird builder punch #117191, inked the edges and and added a black wick with a black extra fine sharpie. 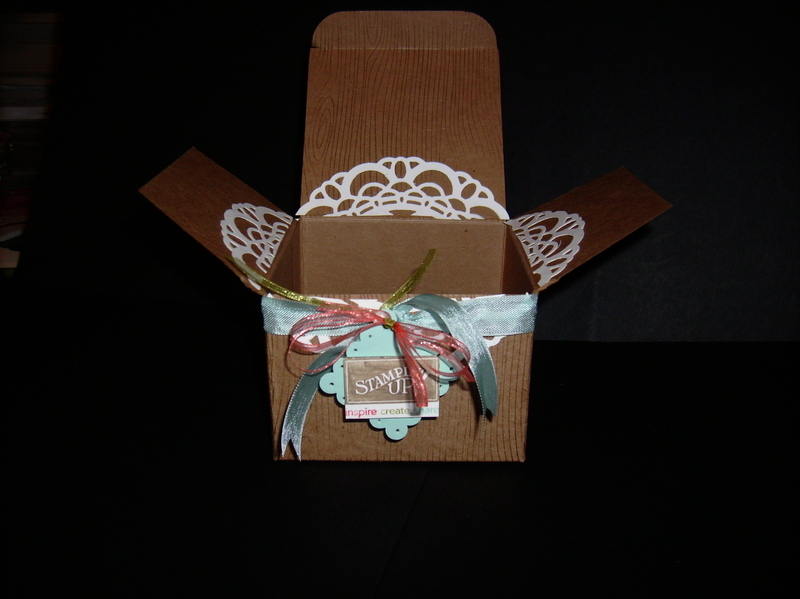 Added ribbon and a button to the whisper white cardstock textured with the stripes embossing folder #123128. I loved this card so much and it was easy to create so I used it for one of my swaps at the Stampin Up Regional seminar today in Columbus Ohio.